Throughout our lives, we are taught to value speed and getting things done quickly. We learn that doing is more valuable than merely being, and that making the most of life is a matter of forging ahead at a hurried pace. Yet as we lurch forward in search of some elusive sense of fulfillment, we find ourselves feeling increasingly harried and disconnected. More importantly, we fail to notice the simple beauty of living. When we learn to slow down, we rediscover the significance of seemingly inconsequential aspects of life …time to indulge our curiosity, to enjoy the moment, to appreciate worldly wonders, to sit and think, to connect with others, and to explore our inner landscapes more fully. Conducting ourselves at a slower pace enables us to be selective in how we spend our time and to fully appreciate each passing moment. This is especially true in Photography! How it was Done: We recently visited The Salton Sea in the desert east of San Diego with some friends, models and a stunning Harley-Davidson motorcycle for some photographic fun. As the sun set, things got dark really fast and we had just one more shot in mind. This shot involved the rider and Harley driving slowly in front of the two models and down the long stretch of road as the camera’s shutter remained open. The idea was that the motion blur of the rider and tail lights would lend a stark and spooky contrast to the two stationary models. To execute this we had to work fast as it get pitch black in the desert after sunset! A Nikon D7000 with a cabled shutter release was set up on a very stable Manfrotto Tripod and set low to the ground. The camera was adjusted manually for a shutter speed of 3 seconds, aperture of f8, ISO100 and focussed on the models with the help of some flashlights. The autofocus was then turned off (the camera would try to track the moving bike as it passed). The rider started his run and just as he passed the camera’s viewing angle, the shutter was tripped. As the driver approached the models, the scene was briefly lit up by a Nikon SB600 Speedlight. The light from the bike’s headlamp continued to light up the road in the distance. These types of shots take a bit of forethought and setup, but when they come to fruition are truly rewarding and often surprising! Harsh light for Photographers is always a challenge – Noon in San Diego is just rough! One must seek some kinda shade, use huge diffusers, have a Crew to be Grips…yikes! Sounds complex. Not really….in harsh light find shade for the subject. Set your DSLR on Manual Exposure and Meter the background. Then use you Fill Flash to light it up! Here we put our Model under the wing of a Fighter Bomber at MCAS, Miramar in San Diego, California. (Top Gun Training was here…check the Movie). We were working a Nikon D7000 equipped with a 17-70mm f2.8, mounted on an Alzo Bracket, Quantum T5d-R flah and Turbo battery pack. The point is, that with the correct gear and understanding any Photographer can overcome technical obstacles and delivery their Vision! A continuation of our series from Marine Corps Air Station Miramar, or MCAS. You may recall a movie by Tom Cruise called Top Gun? It was filmed here. The Museum inside is full of gems, and outside there are so many wonderful planes it boggles the mind. Here we had a photo shoot where Models and Hair and Makeup Artists were kindly asked to bring military or Pin-Up type outfits. Here, this is in the shadow of a Fighter Bomber. We liked the colour contrast and the red contrasting with the subtle camo jacket. This was very challenging light being Mid-day in San Diego. Without hauling portable Studio Strobes, we accomplished this shot with our trusty Nikon D7000 mounted on an Alzo Bracket, powered by a Turbo-3 Battery pack which juiced the amazing Q-Flash. The lens was a 17-70mm Sigma f2.8 which is spectacular for close in Portraits! This time we used the flash in Manual Mode (as well as the D7000), shot in RAW (or NEFF as Nikon likes to call it) to allow subtle corrections in Post Processing. The point is, that for any situation, The Photographer needs to arrive prepared and ready to have quick solutions to technical problems. The job of the Photographer is to make their subjects look Fabulous! Hope we accomplished this…What do you think? 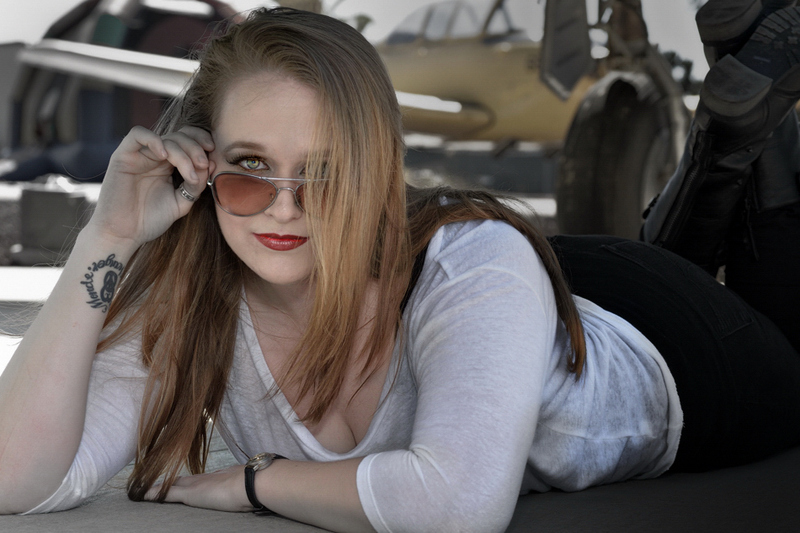 We were invited to a Model Shoot at MCAS Miramar last Sunday. We arrived with our Mom (Security and Key Reflector Grip) an hour before the Event to check out the scene for light – it was already hard at 11 AM and Mom got worried about Contrast and Exposure. She suggested that we seek shelter under a Fighter Bomber and wait for the Make Up Artists (MUA) and Models to arrive. Sure enough, other invited Photographers and Models gravitated to our spot and the fun began! Aeriel was the first of out Hair and Make Up so we grabbed her for some Classic shots reflective of the History of this outside Museum. Here we wanted to capture her Vintage Look under the wing of the Fighter Bomber. The light was created by using a Quantum Flash on a hand-held camera bracket. Nice! The next look we asked her to hide behind the enormous landing gear and give a “Peek a Boo” look. Once again, the subtle off camera flash filled her in….you can tell where the light was by the reflections in her eyes (catch lights) and the small nose shadow. Lovely! Next, after a clothing and make change we went for hard light. With the fighter airplane in the backdrop, we deliberately decided to over expose the shot at the back to draw attention to Aeriel. The next shot wanted to show the Hair and Make up of the wonderful folks in the background who were working their asses off all day…had to capture Areiel’s curl! My Mom had such a blast watching all the Pro Photographers and Models, it was a spectacular day. A Perfect Sunday! Also great credit to http://www.meetup.com/Pro-Am-Photography-and-Models for arranging the Models and Make Up Artists! Thanks Britt! My Security Detail and Key Grip (My Mom) spent the afternoon shooting Models at MCAS Miramar in San Diego. We were the first to arrive and quickly found the prime location. The light was hard and so we brought our trusty Quantum Flash to fill shadows. There were many pretty Models and tens of Photographers with all sorts of gear. I was a bit frustrated since as soon as I consulted with one of the Models as to what I was looking for, set up the pose, the “Sharks” moved in and it seemed like everyone gravitated to the image I had. I quickly learned to secret the Model away, do a quick shot and get out before others could see the vision…funny, eh? So, hundreds of shots later, this Gem popped out. I was tired of the Glam Look and started searching around for something different. Being a Landscape Photographer, I look for angles, reflections and details. As the rest of the gang was happy snapping away, I went under the wing of this plane to capture, what I think, is just special…The reflection of this Model’s legs on the underside of the wing is cool, and her adjusting her shoes. What do you think?